Jared Ward is a distance runner and a marathon champion. In March 2015, he finished third in the Los Angeles Marathon and at the same time became the 2015 U.S. marathon champion as the top American finisher. In his debut marathon, he timed 2:16. 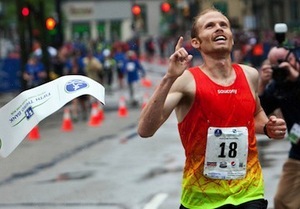 In the fall 2014, he placed second in the Twin Cities Marathon with a time of 2:14:00. His time in the Los Angeles Marathon was 2:12:55, which was his third marathon. His coach, Ed Eyestone, is a two-time Olympic marathoner and track and field head coach as well as cross-country head coach at Brigham Young University, where Ward studied statistics and earned a master's degree in statistics. His master's thesis was on the optimal pace strategy of a marathon. Eyestone said the win in Los Angeles made Ward a contender for the Olympic team. The 2016 L.A. Marathon served as the U.S. Olympic Trials Marathon and Ward ran it in 2:13—in weather in the 70s—placing third and qualifying for a spot on the Olympic team. He accepted sponsorship from international running brand Saucony and will continue to train under Eyestone. Ward ran marathon in the 2016 Summer Olympics in Rio de Janeiro, Brazil, and finished sixth with a time of 2:11:30, his personal best and only his fifth marathon. I just missed enough training that I thought, "This marathon is not going to work." So I called (race officials) and said, "I’m thinking about not running." They said, "Even if it’s not your best performance, even if you only make it halfway, we’d love it if you just came and tried." So Ward went ahead and ran, finishing in the top 10 and making it his fifth top 10 finish of his career. He earned the best finish (6th place) of U.S. men with a time of 2:12:24, his second fastest of his career. As of the end of 2018, his Rio Olympic time of 2:11:30 is his best time. When Ward returned from serving an LDS mission in 2009, it was too late to enroll in BYU’s fall semester and run cross-country with his team. That fall he went to California to watch his brother compete in a region high school cross-country race, and as a prelude to the race, coaches, parents and other supporters were invited to run a race. It was more of a fun run, but because it was timed and organized, the NCAA ruled that would cost him a collegiate season. The decision was eventually reversed in 2014, allowing him to run with his teammates his senior season, but it meant trying to find another purpose in his training. Eyestone suggested a marathon, and they began training for the Chicago Marathon in 2013. Ward was born in Layton, Utah. At Davis High School, he was a three-time state champion in the 1,600 meters, 3,200 meters, and sprint medley (2007). He served a mission to Pennsylvania for The Church of Jesus Christ of Latter-day Saints. Ward and his wife, Erica, are the parents of three children; their fourth is due in January 2019. He is a professor at BYU, adjunct faculty in the Department of Statistics. This page was last edited on 11 December 2018, at 18:19.